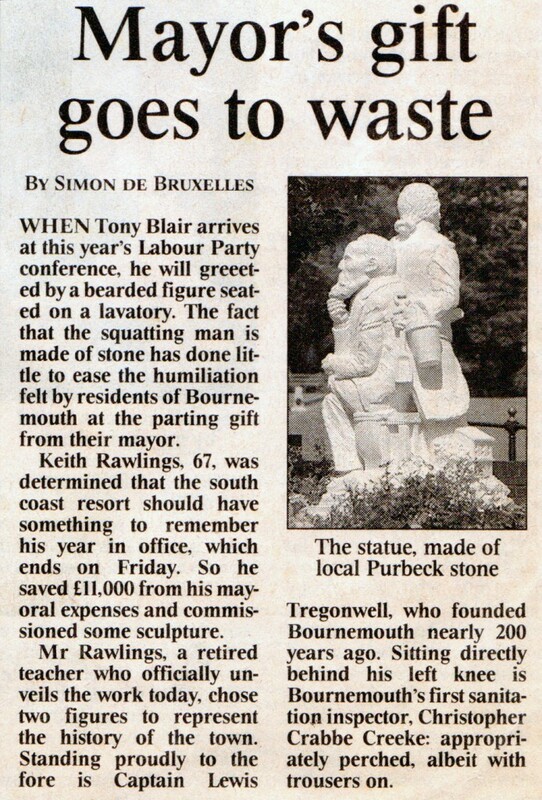 Jonathan Sells’ Tregonwell/Creeke statue gets a mention in The Times newspaper (below). From May 26th, 1999. Tregonwell/Creeke Sculpture by Jonathan Sells, stone carver and sculptor. At first glance, Bournemouth’s newest statue seems typical of public monuments in Britain’s towns. Standing proudly in full military uniform, Capt. Lewis Tregonwell, the resort’s founding father, is reading from a scroll bearing the names of the three Bournemouth citizens awarded the Victoria Cross. Flanked by fountains, the 7ft 6in tall, three and a half ton carving from Purbeck stone dominates the entrance to the Bounremouth International Centre. But the statue’s reverse offers a less staid image, described by the sculptor as a slice of seaside humour. Hiding behind Capt. Tregonwell is Christopher Crabbe Creeke, Bournemouth’s first sanitary engineer, sitting on a lavatory stroking his beard, whilst Capt. Tregonwell holds a bucket and spade behind his back. Several residents seemed less than pleased, but Mr. Rawlings, the outgoing mayor, said; “It is a very witty interpretation of my request for a statue which celebrates the life of two very important figures in the history of the town.” Jonathan Sells, the sculptor responsible, said; “I think it is a very fine piece with a real seaside joke tucked away in it.